These colourful new hooks from Pony are lightweight and comfortable to use. The soft, rubbery handle is easy to hold, while the aluminium shaft is smooth and allows for a very fluid crochet action. This meant that when we tried them out, we hooked for long spells without straining our wrists or fingers. We also love that the set comes in a burst of gorgeous rainbow colours, which, aside from being cheery to hook with, means that each size becomes immediately recognisable without having to glance at the label. This month we feature a number of competitions exclusive to Inside Crochet readers, including a red cord Martha apron worth £60, and exclusive to Inside Crochet! We have two great new competitions for you this month, including a chance to win 1 of 3 sets of Clover Amour Hooks! Time's nearly up to enter this month's exclusive competitions – have you entered yet? One lucky ready can win a set of 14 crochet and knitting books – worth over £180! 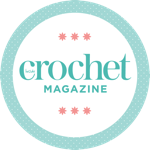 We've teamed up with one of our favourite bloggers (Kinga Erdem) to offer three chances to win a 12 month digital subscription to Inside Crochet magazine. Each worth £31.99! Win 1 of 5 Debbie Bliss Tote Bags! We have 15 pairs of tickets to this year's Chilterns Craft and Design Show and a 5 fabulous Debbie Bliss Totes to give away!